From the beginnings of research into the earth’s deep history in the late-eighteenth century, extinct animals, lost worlds, narratives of life’s history and accounts of palaeontological discovery have exerted a strong hold over public audiences, and been depicted across a range of media. The ‘spectacular’ side of the field – particularly dinosaurs, adventurous fieldwork and human origins – has long been presented as an important gateway into wider interest in science. The practices of palaeontological research, mixing geology, comparative anatomy and evolutionary biology with artistic and imaginative reconstructions of extinct organisms and lineages, also offer important perspectives on the relations between different sciences, and between science and art. And the diversity of prehistoric life, and the large-scale changes across geological history, have been an important means of shifting understandings of ecology, evolution and biodiversity since the nineteenth century. This network aims to look at these issues and link synergistic trends in the humanities and sciences. In the history and sociology of science, the study of popular science is a dynamic field, moving beyond simplistic ideas of dissemination from ‘high’ scientific to ‘low’ popular contexts to more complex models based on coproduction and circulation between the ‘public’ and the ‘scientific.’ In these works, the history of geology and palaeontology – conceptually revolutionary sciences of great appeal to public audiences – have been crucial case-studies. In the evolutionary and earth sciences themselves, public engagement (often in a highly historically-informed manner) has also been a major preoccupation, and palaeontologists and geologists have pioneered innovative new methods of collaborative public engagement, open access publishing, and online dissemination. However, despite the obvious thematic and practical overlaps between these developments, they have occured quite separately from one another. "The Art of Extinct Animals" Pop-up Palaeoart Exhibition at King's College London, December 2017. Over a series of workshops and public engagement events, we will bring together an international group of humanities and social sciences scholars, scientists, museum professionals, artists, and participants from the cultural sector to reflect on these trends and build future collaborations. Mixing theoretical and practical discussions on the public circulation of scientific ideas, we will investigate the importance of palaeontological concepts in the modern world, while also developing new understandings and methods for science communication more generally. We will reflect on the role that popular engagement plays within scientific research, whether this be to gain funds and resources, develop theories and conduct debates, or promote particular messages, while evaluating the reasons for the appeal (or lack of appeal) of particular aspects of palaeontology among particular audiences. 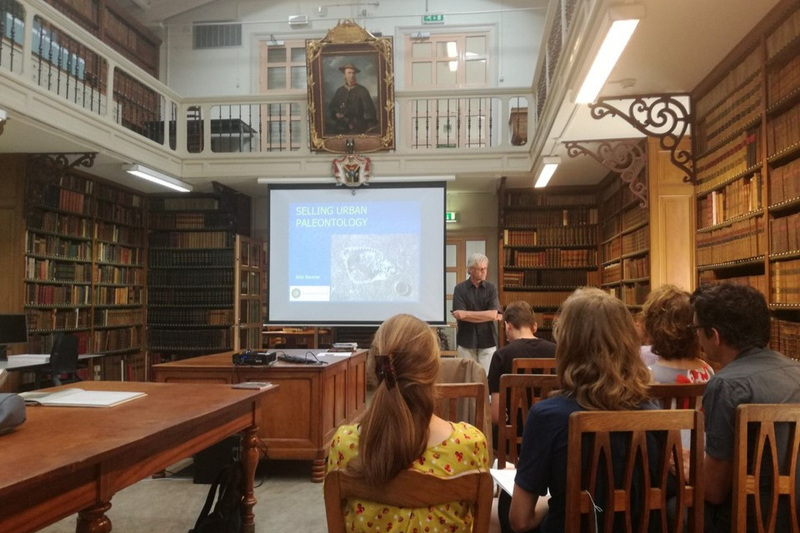 We will also think about how palaeontological outreach can develop in the future, whether through reaching new audiences, developing new techniques of public engagement, and through reconsidering the ways in which palaeontological narratives can contribute to wider public debates. In doing so, we will build collaboration across disciplinary boundaries, develop new perspectives on science communication, and assess the importance of palaeontological ideas for wider debates on nature, evolution and the environment. Pop-up exhibition & Discussion evening at King’s College London, December 2018. The first two workshops were generously funded by King's College London, and the activities for 2018 and 2019 will be funded through an International Research Network Grant from the UK Arts and Humanities Research Council (ref: AH/R007411/1). The network is run by Dr. Chris Manias (King's College London) as Principal Investigator and Prof. Joe Cain (University College London) as Co-Investigator, and with Dr. Ilja Nieuwland (Huygens Institute) coordinating the meeting in Amsterdam and Dr. Paul Brinkman (North Carolina Museum of Natural Sciences) coordinating the meeting in Raleigh. The public events will all be free and open to ticketed members of the public. Due to space constraints, attendance at the workshops will be limited to speakers and a small number of invited additional participants - please get in touch if you would like to take part in any of these. The talks at the workshops will all be uploaded to this website as audio and video, and participants will produce blogposts on the issues raised and discussed. As well as the workshops and public engagement events, we are also aiming to produce an open access collection reflecting on and summarizing the main results of the network and its discussions.